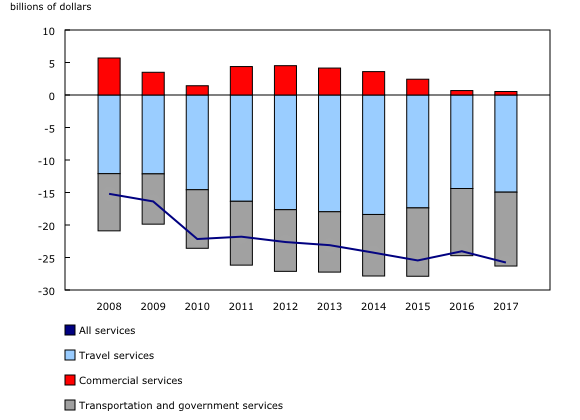 Canada's deficit on international transactions in services expanded by $1.7 billion in 2017 to $25.8 billion, mainly reflecting higher transportation and travel services deficits. This marked the fifth annual increase in the services deficit in six years. The services deficit has been generally growing since the mid-2000s, mainly due to an expanding travel deficit. Canada's exports of services totalled $114.2 billion in 2017 while imports amounted to $140.0 billion. By comparison, exports of goods totalled $549.6 billion while imports amounted to $573.6 billion, for a deficit of $24.0 billion. On a geographical basis, the services deficit with non-US countries rose by $1.6 billion in 2017 to $13.7 billion. The deficit with the United States edged up $0.1 billion to $12.1 billion. 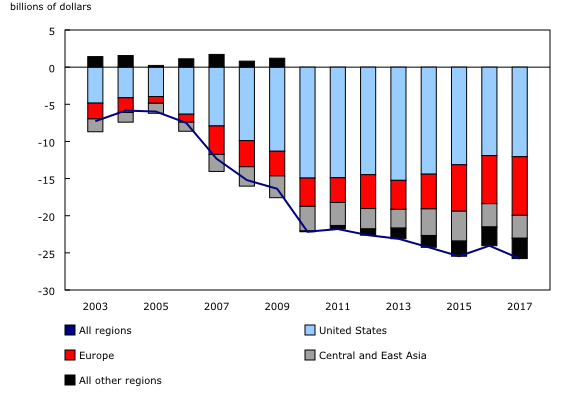 This marked the second straight year that the deficit with non-US countries exceeded the deficit with the United States, in large part attributable to higher imports from non-US countries. The deficit of transportation services, which cover the international transport of merchandise and people, grew by $1.0 billion in 2017 to $11.7 billion. Receipts rose by $0.7 billion with increases split between air and water transportation. Payments rose by $1.7 billion on higher spending on air and water transportation. These increases were in line with higher activity in the international trade in goods. The international travel deficit rose $0.6 billion in 2017 to $14.9 billion. The deficit with the United States was up by $0.5 billion, as Canadians increased their travel expenses in the United States for the first time in three years. The deficit with non-US countries was unchanged at $3.5 billion, as both exports and imports increased by $1.8 billion in 2017. The surplus in commercial services was down by $0.1 billion in 2017 to $0.5 billion, as growth in payments outpaced that of receipts. Imports of commercial services were up by $1.5 billion, led by higher payments in financial services and audio-visual services. Exports rose by $1.3 billion, with larger receipts in management services and in computer and information services. Securities trading, and the corresponding commissions generated from these transactions, has been a major source behind the decline in the commercial services surplus in the past years. Canadian firms have been actively raising funds in international credit markets over this period, contributing to the significant increase in payments of commissions to foreign firms facilitating this activity. On a geographical basis, the overall deficit with non-US countries was up $1.6 billion to a record $13.7 billion in 2017. The deficit with Europe widened by $1.4 billion to $7.9 billion, mainly on a higher deficit with the United Kingdom. Meanwhile, the deficit with Antilles countries, led by higher travel payments, was up by $0.6 billion to $3.3 billion. The deficit on international transactions in services with the United States edged up $0.1 billion in 2017 to $12.1 billion, following three consecutive annual declines. This change mainly reflected higher travel and transportation deficits. These increases were moderated by a higher surplus in commercial services as exports, led by management services, rose more than imports. Canada's imports of services have historically exceeded exports of services, with persistent deficit positions vis-à-vis the United States, Mexico, Antilles and Europe. This is the annual release of Canada's detailed international transactions in services. This release contains details by country and service category for international transactions in services. Trade in services covers transactions in travel services, transportation services, a range of business and professional services referred to as commercial services, and government services. The results for the 2017 reference year are preliminary and were derived from a combination of the latest 2016 benchmark surveys and 2017 quarterly surveys. This year, Statistics Canada introduces two supplementary sets of statistics regarding trade in services. Trade in services by mode of supply provides information on how services are delivered and consumed. Trade in information and communications technologies (ICT) and ICT-enabled services provides information on services that can be delivered remotely over ICT networks. Concepts, methods, and exploratory results for these two sets of statistics are available online (see Products below for more information). The document Trade in services by mode of supply: definitions, collection strategies and preliminary results is available online. This products provide information on concepts, methods, and exploratory results on how international services could be delivered and consumed. The document Canada's international trade in information and communications technologies (ICT) and ICT-enabled services is available online. This products provide information on concepts, methods, and exploratory results on international services that can be delivered remotely over ICT networks. The updated Canada and the World Statistics Hub (Catalogue number13-609-X) is available online. This product illustrates the nature and extent of Canada's economic and financial relationship with the world using interactive graphs and tables. This product provides easy access to information on trade, investment, employment and travel between Canada and a number of countries, including the United States, the United Kingdom, Mexico, China and Japan. To enquire about the concepts, methods or data quality of this release, contact Denis Caron (613-808-2278; denis.caron@canada.ca), International Accounts and Trade Division.